There are many parents who search high and low to find the perfect name. Sometimes it is a matter of "I'll know it when I see it" and other times they have very specific guidelines they wish to follow. For example, perhaps these parents have a long last name to bestow upon a child and want to find a short first name to balance things out. They end up looking for 3 or 4 letter names and fall in love with a list like this one. Thus, little Ian Christensen is named! Many of these may also be a short-form or nickname of a longer name. For instance, Gus could be short for the much longer Augustus; and while Max can certainly stand alone, it may inspire you to choose Maximilian as a formal name and simply call him Max. Whatever your reasons are for browsing a list like this, be assured that these are some of the very best 3-letter names available to you! Which are your favorites? 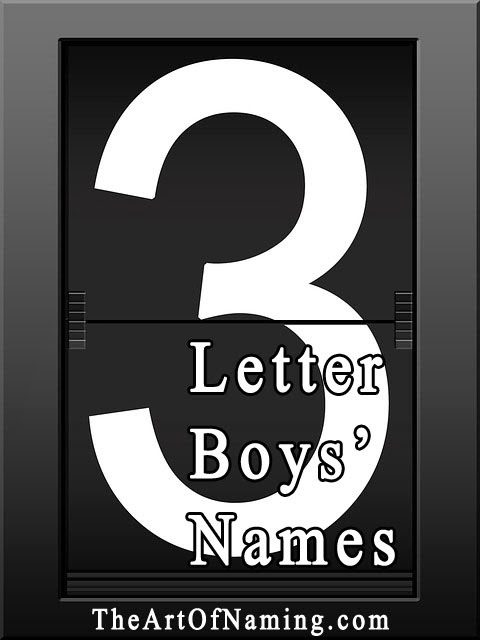 If you're looking for a short name, be sure to also view this list of 4-Letter Boy Names and One-Syllable Boy Names for further inspiration! For a girl, try the Cool, 3-Letter Names for Girls list too! I like Avi, Baz, Dax, Eli, Ian, Jax, Kit, Leo, Max, Neo, Rex, Tye, Van and Wes.